It was almost a month since my last journey. I really missed travelling this long. My cousin’s wedding engagement beckoned as another opportunity to travel. Wasting no moment, I headed straight to Madiwala (on a bus fanning trip), and headed into Friends’ Travels. Tickets were blocked quickly – I prefer blocking seats over confirming them now – my journey plans change at the last moment – this allows me the flexibility to change my trips as and when required. Two seats (me and my dad were travelling) were blocked in the Kallada G4 bus to Pathanapuram – Oh yes! I was travelling to Ernakulam this time, and not upto Thrissur like every other time. 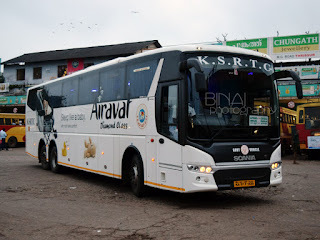 However, there were some sudden thoughts and I got my ticket changed to the Trivandrum bus instead – I did not want to be late for the function – the decision turned out to be an image saver. Around 10~10:30-ish in the morning, a person from Friends Travels called me and confirmed that I was travelling that night. I confirmed my journey. That was one very busy day in office – unusually busy with work throughout the day. All that was topped with a staff meeting at the end of the working day! After all this, I left office at 1730hrs! I took the NICE road, and was literally flying to make it home on time. There was heavy traffic block as I left NICE road and entered Bannerghatta road – it took some off-roading to make it at home on time. I reached home at 1835hrs – not bad considering the fact that the distance through NICE road was 46kms! Anyways, I’ve not travelled in 4602 as well – Oh! 4602, KA-01-AB-4602, was earlier run on the Bangalore-Kottarakkara route. This was the first bus with the now characteristic cream base colour – this bus had metallic brown coloured lines on cream base. The bus was already parked at the pump, and people had finished boarding. As I neared the bus, spotted a driver I knew – asked him if he was taking my bus – he replied “No” – he was driving the iShift that night (that too was to Trivandrum, but via Nagercoil). The drivers of my bus weren’t around and there was no cleaner as well. I had two pieces of baggage that I wanted to put in the dickey. After some waiting, the cleaner came and put the bags inside – no tags or even marking on the bag about my seat number – not a great start. I was disappointed. We got into the seat and occupied our seats - #25 & #26. Blankets (er! Shawls) were already in place. 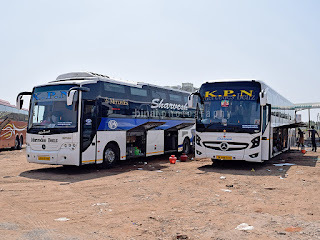 Soon after we settled down, Sujith (Friends Travels) came around to check passes and confirm that everybody was on board – we had 46 passengers from Madiwala. One would board at Hebbagodi and two more at Hosur. The Kottarakkara bus (Kallada G4) left at around 2020hrs. We started off from Madiwala at 2028hrs – early by 2 minutes. The bus took a right turn at St. Johns signal, and headed out through Madiwala market. There was traffic all-around, and it took some time to get on BETL. A movie was switched on – the rear LCD panel was not opened. Once on BETL, the driver meant business – however, the horrible weekend traffic at BETL toll gate spoiled our party and we were down to a crawl. We picked up a passenger near Hebbagodi (2055hrs) and continued our progress. Things were all fine till we reached the last flyover in Karnataka – traffic was a complete standstill on the flyover itself. Our driver stuck to the left most lane and managed to keep the bus moving all the time. As we neared the toll gate, spotted the Kottarakkara B9R also waiting. Both the buses stopped parallel to each other, and the crew started talking to each other. Both the buses left the Toll gate together – the checkpost was jammed up as well. It was a painful crawl all the time – some vehicles crossed over to the opposite lane and dodged traffic. Being festive time, the TN RTO officials were checking papers of buses passing through – they did not stop our vehicle though (may be since ours was a regular service and not a special bus). Traffic lightened after the checkpost – not exactly free, but still not standstill. We picked up one passenger just before Hosur flyover, as the driver called up the second passenger. It seems that the second passenger was near the bus station, and not near the beginning of the flyover as informed to him. The driver did not grumble – he headed towards the bus station and picked up the passenger. We left Hosur at 2230hrs – two full hours to reach Hosur from Madiwala! After Hosur, the bus took a right turn, and we headed towards Rayakottai. I guess the driver had prior information about the traffic scene in the Krishnagiri stretch. The Rayakottai road was narrow and not in great shape. Traffic too was somewhat heavy – lots of trucks were spotted. I slept off soon after we crossed Rayakottai. The movie got over now. As usual, the crew did not bother switching off the TV. In all other operators the crew immediately turn off the TV, so that passengers are not disturbed – but in all my journeys in Kallada G4, the crew never bothered. Since my seat was towards the middle of the bus, the light from the TV did not matter much. I slept peacefully. I woke up when the driver braked somewhat hard and curved to the left sharp – we were on the Salem flyover now. A Kallada (Suresh Kallada) non-AC bus gave us company at this time. The time was around 0100 hrs. I slept again. Woke up sometime later, and found that the bus had come to a complete standstill. I slept off again. Woke up sometime again, and found the bus standing at the same place! My dad was saying that we were at the same place for almost an hour now! I slept off again! 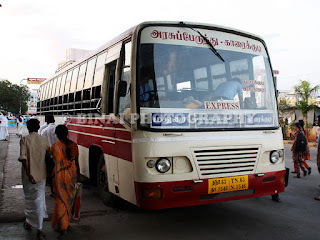 I vaguely remember that the bus had turned off NH at Perundurai, and we took the route via Palladam. I woke up again, and found the bus standstill – but this time at a fuel station. The time was 0416hrs. My dad was fast asleep now – did not disturb him and decided to stay in the bus itself. The bus started off almost immediately after I realised we were at a pump. That was the regular fuelling stop near Madukkarai (at the end of Coimbatore bypass). The bus made a brief halt at Chavadi outgoing check post, and then continued again. They did not stop at Walayar checkpost this time. I slept off again. I woke up with the bus shook violently – we were running through Kuthiran! I wonder why the driver came through Kuthiran – road was inexistent there, and the entire bus was swaying. I slept off as the bus entered better roads, around Pattikad. Woke up again as the bus just left Paliekara toll gate (the controversial toll gate, just at the end of Thrissur bypass, on NH47). My dad confirmed that we did not drop any passengers at Mannuthy – G4 did an excellent job by reserving this bus for passengers travelling to Ernakulam and beyond only. It was 0610hrs by now. I decided to not sleep anymore and pulled up the backrest. The driver was doing good speeds now – he was honking heavily now. We crossed Ankamaly at 0632hrs. The driver maintained good speeds after Ankamaly, but stopped using the musical horn. He was now using the single tone horn. As the bus crossed Kalamassery, some passengers slowly got off the seat and headed towards the door. I got off the seat as we crossed Edappally toll and headed towards the door. The bus stopped at Edappally bypass junction, exactly at 0651hrs. The cleaner was already outside, helping passengers with getting their baggage out. Even though the bus was late, the crew did not show any urgency or did not misbehave with passengers who were taking their own time to get off the bus or collect their luggage. 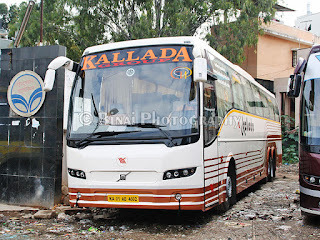 Interestingly, S.Kallada’s Pathanamthitta bus was standing right in front of our bus! Concluding remarks: The bus, KA-01-AB-4602, had run around 75K kms. It was really well maintained. My seat was right under the AC unit – the unit made a horrible metallic noise (a magnified version of the sound we hear from the compressors in domestic refrigerators) everytime the compressor started. The sound was very irritating – I’ve experienced this earlier as well. I usually avoid taking seats in the middle of the bus for this reason – I prefer the growl of the engine over this noise from the AC. Both the drivers were well behaved – they were a bit rash as the day broke – may be since they were close to three hours late, and had close to 250kms more to go. The drivers did not use the horn at night, but started using them soon after it was day. There was one incident of heavy braking – the driving was otherwise very sleep-friendly. Baggage tags were not used, nor did they make any marking on the bags – it does give a sense of insecurity, since it was all upto the passenger to identify their bags. Since no passenger got off en-route, cannot comment on the cleaner’s method of alerting passengers – at Edappally, he did shout out. The end-to-end journey took 10 hours and 23 minutes – on the higher side, but can be forgiven due to the traffic block. If we see differential timings, the bus took around 2:30hrs for Hosur-Salem bypass, and around 2:35hrs for Madukkarai-Edappally. The driver did a good job at maintaining pace. Will I take this service again: Why not? 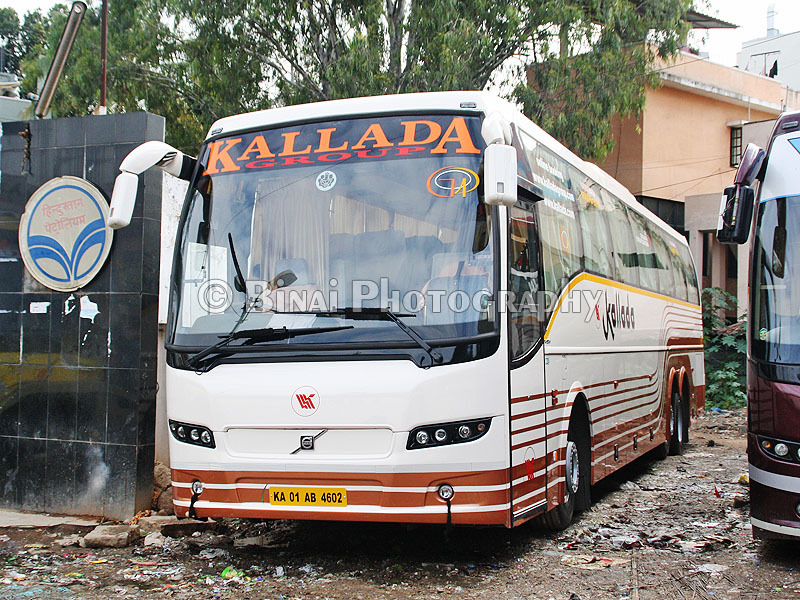 I am in love with Kallada G4 – excellent service from a home grown operator. They need to set right some small problems though. G4 has now mixed up all their buses. The TVM bus (Yellow Liner) was seen on BLR-EKM-KTYM route. Wonder why they didn't went via SRR- & 10 hrs 23 minutes is little bit slow- Viji took me in 9hrs despite traffic(Via Rayakottai). I don't think this 10:23 was slow. The bus was standstill for 1.5hrs at Perundurai due to some accident. It took almost 2+ hours for Madiwala-Hosur. The bus took only 2 hrs for Hosur-Salem, and only 2.5hrs for Walayar-Edappally. These show that the driver was doing a very good job. But delays due to accidents/blocks can always be pardoned.